Recently I read “The Normal Christian Life” by Watchman Nee. In the last chapter of the book he deals with the alabaster jar. Let me begin by saying that I have this habit of writing in the margins of books while reading. I guess it’s my way of dialoguing with the author as I reflect on just what the author is trying to say. What follows are some of my reflections and margin notes from the reading of that chapter. The first thing I noticed is what Jesus said about the event. He said, “wherever the gospel is preached throughout the world, what she has done will also be told in memory of her” (Mark 14:9). Jesus said that the two events, the preaching of the gospel and the pouring out of the alabaster jar, would always go hand in hand. We won’t rightly be able to tell the gospel story without also making mention of what the woman did. But exactly what was it that she did? The accusation by Judas (John 12:5) and the rest of the disciples (Matthew 26:8) was that the woman “wasted” valuable perfume, worth a year’s wages for the average labourer, on Jesus. Now here’s the question I asked myself: “Is it possible to waste something on Jesus?” We need to first clearly define what we mean by “waste.” Essentially it means that we use too much of something when less would have sufficed. Human reasoning said that pouring that much of the perfume on Jesus’ head was wasteful because just a little would have been enough. Ultimately, by saying that it was a “waste,” the disciples were devaluating Jesus. They were saying that He wasn’t worth as much as was being spent on Him. They tried to justify their views by saying that the perfume, worth a year’s wages, could have been sold and the money given to the poor. But the concern for the poor was a secondary issue. It was the proverbial “putting of the cart before the horse.” Sure, it all sounds spiritual enough; sell something valuable and give it to the poor. But instead Jesus says that the poor they will always have (Matthew 26:11), and as such, there will always be opportunity to give to them. Again, what is the first question? The first question is, “is Jesus worth one hundred percent, or would pouring out everything on him be considered “a waste?” How we answer that question begins with another question: “Who is Jesus to me?” Is He the almighty God incarnate, who loved me so much that He actually died in my place on the cross so that I might be set free from the power of the devil by being set free from the sin that has so entangled my life? Did He die but also rise from the dead on the third day, and so doing, give me the opportunity through faith to also live with Him today, and beyond my grave, in all eternity? If that is who Jesus is to me, then maybe giving Him one hundred percent is strangely even too little to give. The truth is, anything less is really not enough. On the other hand, if Jesus is just another religious figure (or icon), then maybe giving that much is a waste. Is that what the disciples saw Jesus as? I think so. At that point, they themselves still did not see who Jesus really was. At that point, he was simply just another rabbi. 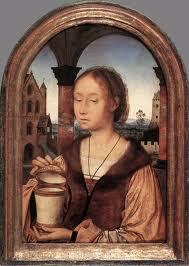 Little wonder, then, that pouring out the whole alabaster jar was viewed as wasteful. The whole thing is the widow’s mite story all over again (Luke 21:1-4). The religious gave a small portion, and made a big deal in doing so. They proudly gave their ten percent to God. The poor widow comes along and pours out her “alabaster jar” and out comes two little copper coins. What was the difference? The difference was that she poured out her alabaster jar and gave everything of value that she had, one hundred percent. The religious, on the other hand, left their alabaster jars safely at home and only brought Jesus a token sample of it. We need to keep in mind what the Gospel message really is. The Gospel is what brings each of us face to face with a true estimate of His worth. What did it cost God to bring you and me the gift of salvation? How much is that gift worth to us? I believe that is why Jesus said that what she did in pouring out the alabaster jar would always be told together with the Gospel itself. So here we all sit on the start of a yet another new year. What are we going to do with it? Are we going to continue on pretty much as we always do, content with our religious habit of giving Jesus lip service only? Or are we going to boldly go in faith where most of us have never gone before, myself included, and pour out our alabaster jars on Jesus. Are we going to continue labelling others who pour out their alabaster jars as wasteful kooks and radicals? Or are we going to join them by pouring out our own alabaster jars on Jesus and in so doing, become radicals for Jesus ourselves. That’s where I want to be. Can it really be a “waste” to pour everything of earthly value on Jesus? I wonder.